Tonight We Make History (P.S. I Can't Be There) at the gallery Blain Southern in Berlin is Harland Miller's first solo exhibition in Germany. Departing from his use of appropriated imagery, the exhibition comprises many new large-scale paintings that incorporate his own designs, which is a first for the artist. He takes formal and conceptual inspiration from the abstract geometrical covers of popular psychology books of the 60s and 70s, an era when positive messaging often masked societal neurosis. In this video, we attend the Private View of the exhibition that opened during the Gallery Weekend Berlin 2016. Three metre high paintings with titles such as Overcoming Optimism and Back on the Worry Beads occupy the main space of the gallery. Often the same text appears on different compositions, demonstrating how form and colour relationships can change the way in which titles are interpreted. Upstairs, a new body of the artist's most iconic artworks, The Penguin Books Series paintings, are bought together including; High on Hope, I'll Never Forget What I Can't Remember and the titular Tonight We Make History (P.S. I Can't Be There). 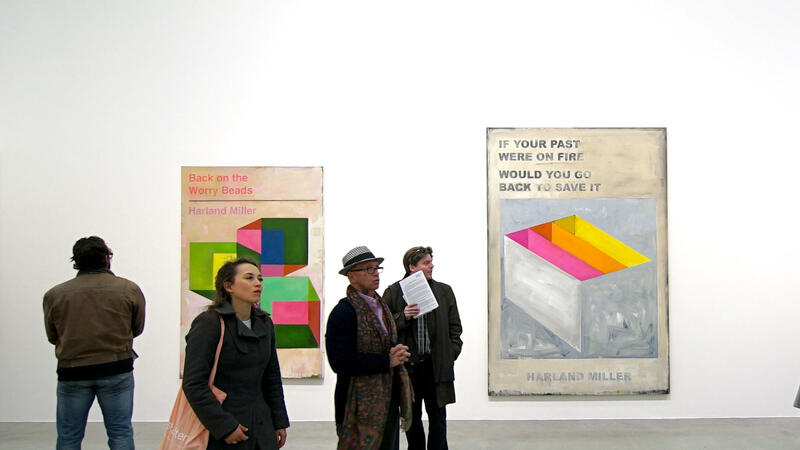 Harland Miller: Tonight We Make History (P.S. I Can't Be There) / Blain Southern Berlin. Private View, April 29, 2016.